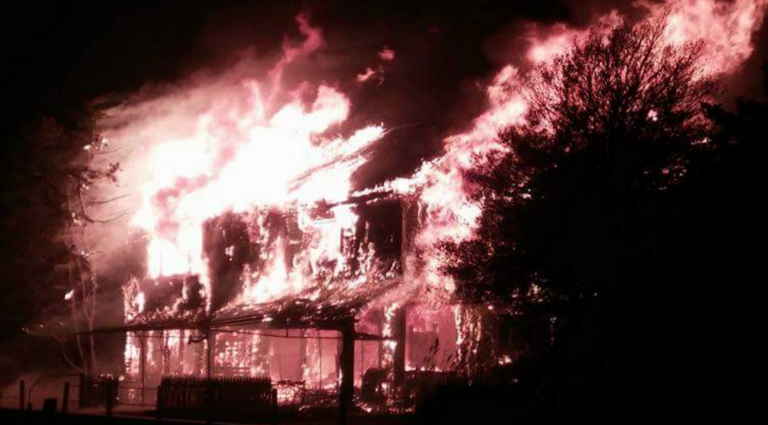 Firefighters from northern Ocean County battled a major residential fire last night in Mantoloking. The blaze on Channel Lane broke out around 6:30 p.m., according to an Ocean County Police, Fire and EMS report on Facebook. Responding firefighters discovered heavy fire through the roof of the two-and-a-half structure, with a partial roof collapse occurring before 7:30 p.m., the report said. A photo from the scene by Bruce Roland showed the entire structure, which is a seasonal home and was unoccupied at the time, engulfed in flames. Two firefighters were injured at the scene, NJ.com reported. Mantoloking Fire Company Chief Larry Gilman suffered a heart attack and is currently in stable condition in the intensive care unit at Ocean Medical Center in Brick. A Bay Head firefighter was treated and released from the same hospital. Properties along Channel Lane front on the Barnegat Bay. According to emergency radio transmissions. firefighters drafted water from the bay to support suppression efforts and protect adjacent properties. Crews brought the fire under control later in the evening.